In the article The Cost for IT Services in Europe we focused on prices in almost every European country in order to help those looking for IT outsourcing services make the right choice. This article goes further and scales our research to the global level. Before getting down to analysing prices across the world, let’s remind ourselves and summarize all the assumptions we made, and the tools that we used to get to well-grounded conclusions. We chose Elance online staffing platform to use the data on individual and corporate freelancers employed in the IT industry. This research considers only the countries with more than 1000 representatives under the category “IT and Programming.” In other words, the scope of this study includes freelancers and companies, which provide any sort of services related to software development, from mobile and web development, to design and marketing. We considered the cost for IT outsourcing services in separate countries, as well as in the entire regions, such as the Americas, Africa, the Middle East, the Continental Asia, and the South-East Asia. 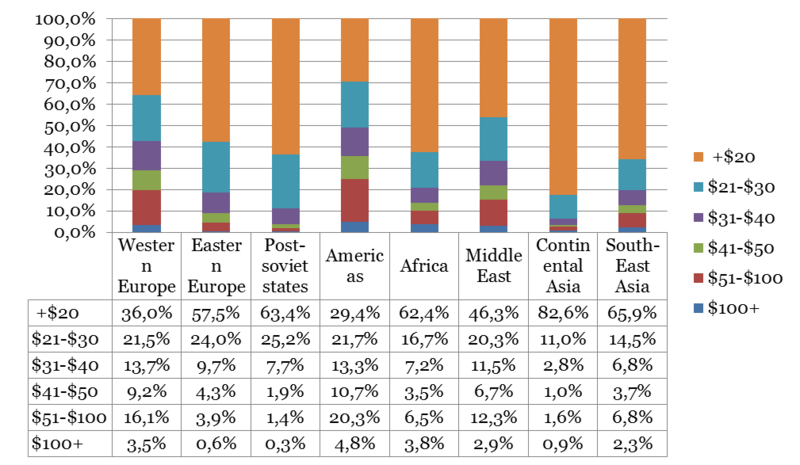 In addition to these regions, information about Western Europe, Eastern Europe, and post-Soviet countries, reviewed in our previous market study, was included in this research. A low-priced service generally means a poor-quality deliverable. An average-priced service typically corresponds to sufficient-quality. Services for a price “above average”, in our opinion, will most likely satisfy a customer given that the cost is, as a rule, strongly correlated with quality. High and very-high prices are simply not affordable for many, and furthermore, possess additional risks. 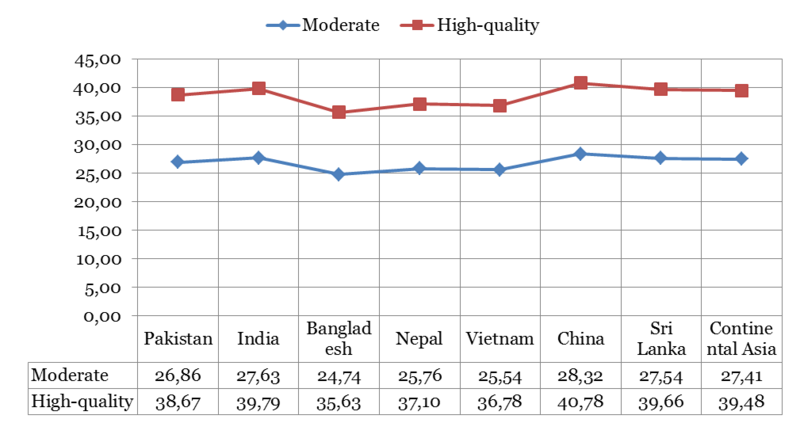 Since correlation of price and quality differs in various locations, this research will help you clarify what cheap, cost-effective, and expensive means for a particular country and region. As mentioned above, we considered both individual and corporate freelancers in our IT cost analysis study. What is the main difference between them? Individuals charge less for their work than companies. 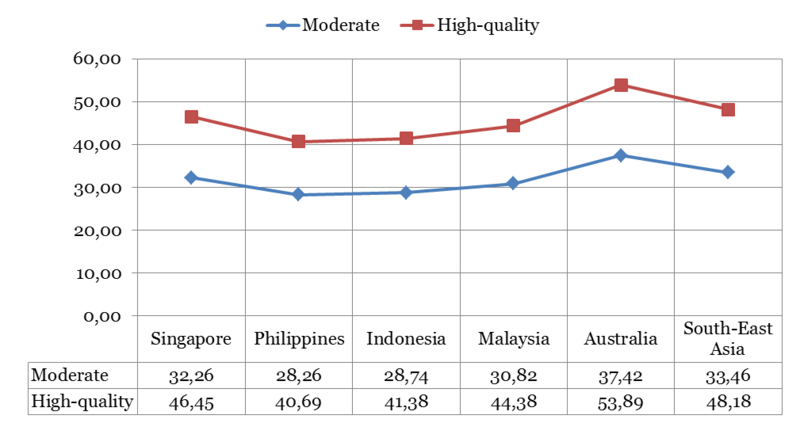 The gap between prices for comparable services charged by freelancers and companies is greater in developed countries than in developing ones due to more expensive value-added services, higher administrative costs, taxes, and other expenses which are incurred by companies but not individuals. The number of IT-freelancers per market is much higher than the number of outsourcing or consulting companies (generally this ratio is 5 to 1). Companies are typically more effective and deliver a higher quality deliverable than individuals. A freelancer can hardly embrace the entire scope of work needed to develop a great product. There is a number of top-level professional companies both small businesses and large enterprises, which are not registered on Elance and, therefore, not presented in this research. Rates charged by such companies could be twice or even three times as high as the average price for IT services we calculated here. Despite the difference described above, the methodology we used for calculation allows us to get an entire picture of the distribution of the cost for IT services worldwide. In other words, the results of this research are applicable to all countries and regions, regardless of whether we consider individual or corporate freelancers. We considered only five countries from this region – the USA, Canada, Mexico, Brazil and Argentina. The USA is home for almost 63,000 individual and corporate freelancers registered on Elance, which is the second most largest market for IT development services in the world after India. We can see that the Unites States and Canada have a significant number of freelancers with rather expensive IT services. Almost a quarter of all the freelancers we considered in the USA and a fifth in Canada belong to a $51-$100 pricing category, whereas individuals and companies that charge more than $31/hour amount to a half of all the respondents. Prevailing price ranges for Mexico, Brazil, and Argentina are +$20 and $21-$30/hour, which amounts to almost three quarters of the respondents. Brazil, though, has freelancers with a slightly more expensive price list among the three. Excluded extreme price ranges (both the lowest and highest). Multiplied the mid-value for a price range by the total number of representatives of a given pricing category. For example, the $31-$40/hour price range corresponds to the mid-value of $35/hour. Summed up all the results and divided them by the total number of IT companies and individuals registered on Elance in a given market. Deducted/added 20% from/to a given average price in order to have a price interval, specific to a particular country or region. It’s important to note that the prices we calculated are not exactly “average”, but “average recommended prices.” We believe that you are likely to get a high-quality product for the price indicated in red, and a moderate-quality product for a price indicated in blue. 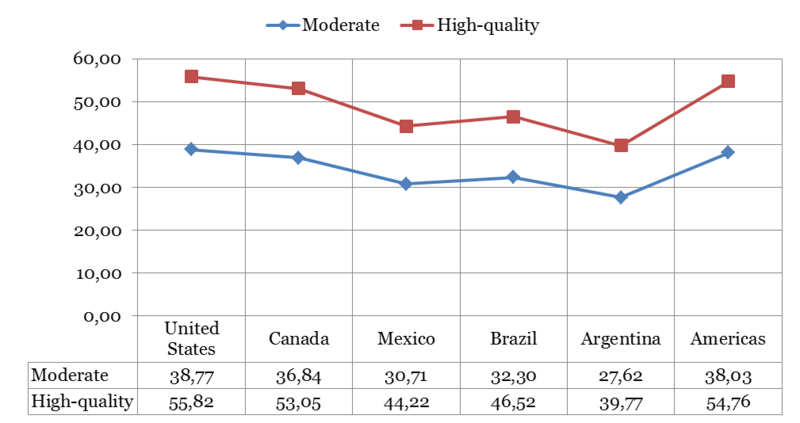 We can see that a product of a moderate quality will likely cost $30/hour or more in Mexico, Brazil, and Argentina, and $40/hour or more in the USA and Canada. Add to that at least $15 and you’ll get a higher quality product. We recommend the $41-$50/hour price range for IT-services in Brazil, Argentina, and Mexico, and $51-$100/hour in the USA and Canada. Only five countries on the continent have more than 1000 representatives registered on Elance. They are Egypt, Kenya, South Africa, Nigeria, and Morocco. We see unbelievable results! 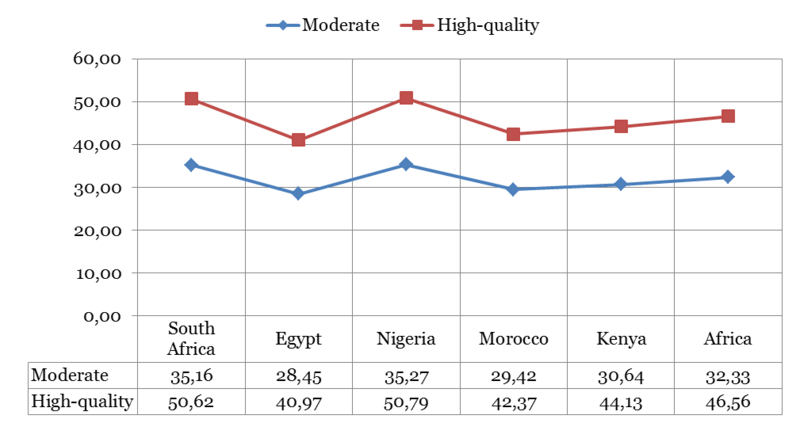 High-quality IT services in Africa are more expensive than in both Eastern and Western Europe (check out the relevant charts in our European market research). Moreover, the average recommended price to outsource in South Africa and Nigeria is only $3 less than in Canada. These results can be explained by the fact, that Africa, with its 1 billion population, has only 10,000 IT-companies and freelancers registered on Elance, which is only o.001% of the entire continent’s population. To compare, in the US, for example, this ratio is 0.02%, i.e. 20 times more developers per capita than in Africa. In Serbia there is 0.05% of programmers per capita or 50 times more than in Africa. 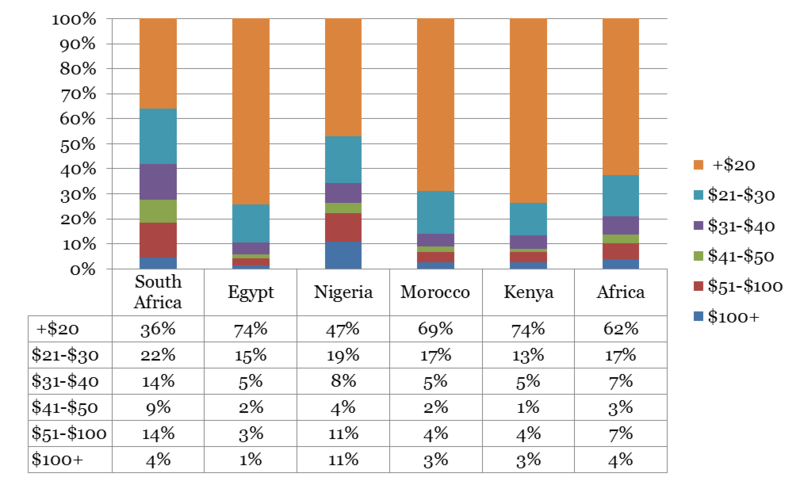 It seems Africa has an ‘empty’ market of IT services. Furthermore, due to a rather low level of education, it’s really difficult to find a developer who could provide you with a high-quality product there. We recommend the $41-$50/hour price range for IT services in Egypt, Morocco, and Kenya, and $50/hour or more in South Africa and Nigeria. Turkey, Israel, and the United Arab Emirates (UAE) represent the Middle East region. Israel seems to be more expensive among them with pricing categories similar to the USA, Scandinavia, and Western European countries. 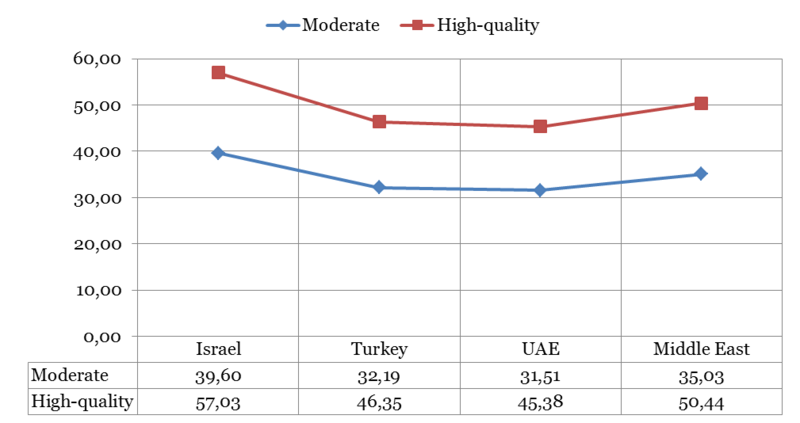 The UAE is cheaper in terms of prices for IT services than Turkey and Israel. Supposedly, this is because rich customers from the UAE could afford the most expensive IT products offered by consulting companies from Western Europe and the North America. Therefore, they are not seeking for opportunities in the internal market. The recommended price range for IT-services is $41-$50/hour in Turkey and the UAE, and $51-$100/hour in Israel. As we mentioned above, India is the largest IT market in the world, with more than 100,000 individual and corporate IT freelancers registered on Elance. However, Continental Asia incorporates other countries as well, such as Pakistan (19,555 respondents), Bangladesh (10,453), China (5,811), Vietnam (2,942), Nepal (1,633), and Sri Lanka (1,585). Chinese developers and programmers work mainly for the internal market and therefore, are not represented on Elance to a sufficient extend. 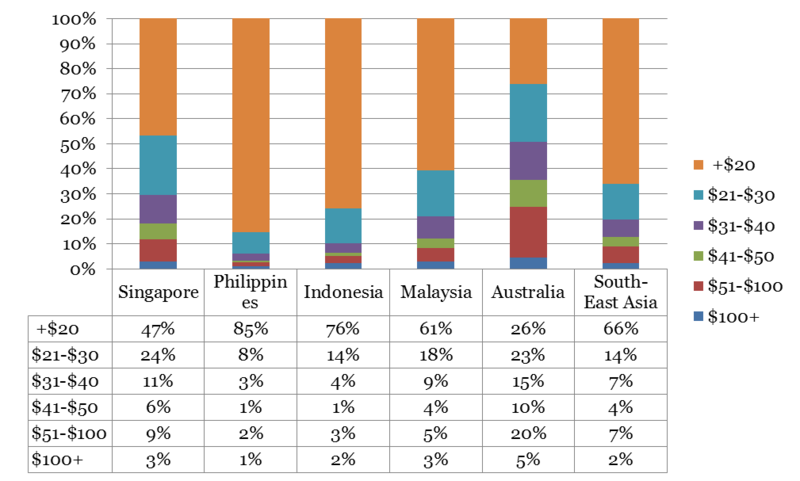 Nearly 95% of respondents in Continental Asia charge $30 per hour or less for their services, which is the largest ratio in this pricing category in the world. Moreover, 83-84% of respondents charge $20/hour or less. Do you still want to know why India is the top-destination for IT services outsourcing? 100,000 IT specialists who speak English as a native language and agree to work for $20 per hour or less, seem to be a great bait for entrepreneurs. This statistics is true for all countries in Continental Asia except China, where prices for IT services are somewhat similar to Southern Europe (Italy, Spain, Portugal) and some Eastern European countries (Poland and Czech Republic). What differs these countries from others is a lack of very expensive freelancers, and at the same time, a small number of the cheapest ones. Again, it’s important to highlight that this research doesn’t show the average price for IT services per country (for example, in India it’s $15/hour). Instead, we focus on the “average recommended price” for a quality product in a given market. The recommended price range for IT-services in Continental Asia is $31-$40/hour ($40 per hour and more in China). This region comprises 5 countries - Singapore, Philippines, Indonesia, Malaysia, and Australia. This isn’t a popular destination for IT services outsourcing. The most representative country in this region is Philippines, with only 6,255 respondents registered on Elance. These countries are very versatile in terms of prices. Philippines and Indonesia are rather cheap, Singapore and Australia are pretty expensive, and Malaysia is somewhere between them. The recommended price for Australia is the same as it is for Canada (i.e. $40-50), Singapore is similar to the UAE (i.e. $35-45), and price ranges in other countries of the region equal the recommended price range in China (i.e. $40). The recommended price range for IT-services in Philippines and Indonesia is somewhere around $40 per hour, in Malaysia and Singapore it’s $41-$50/hour, and in Australia the recommended price jumps to $51-$100/hour. Read also: How much does it cost to design an app? The Americas is the only region in the world, where the cheapest price range, $20 per hour or less, applies to less than 30% of freelancers registered on Elance. Western Europe and the Middle East are somewhat similar to the Americas, with 36% and 46% of respondents respectively selling their services for $20/hour or less. Other regions have more than 50% of representatives charging $20 per hour or less, excluding Continental Asia, which has a huge ratio of 83% of freelancers under the lowest pricing category. 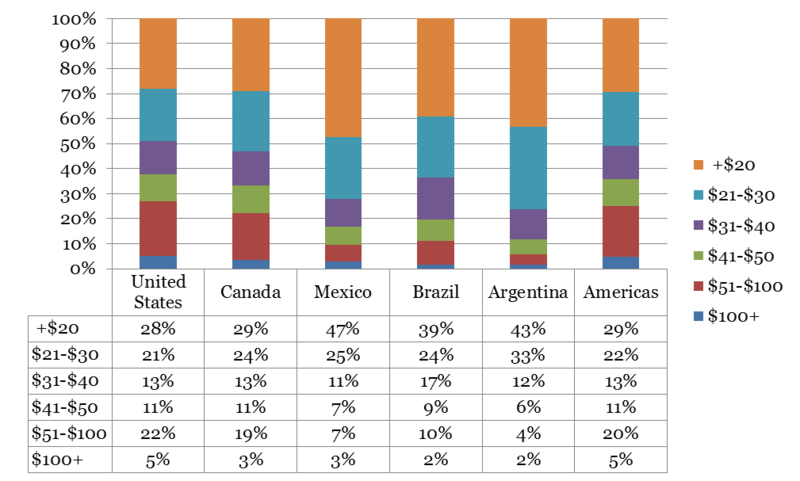 80% of all freelancers from the Americas region are the US-registered respondents. Therefore, this region mainly represents the USA. The Americas lead the most expensive price range with a quarter of American freelancers charging $51 per hour or more. In Western Europe this ratio is nearly one fifth. In comparison, only 1.7% of freelancers from post-Soviet countries, and 2.5% from Continental Asia, will cost you $51/hour or more. In Western Europe, the Americas, and the Middle East you are likely to get a high-quality product for an hourly rate of $51 or more. In Eastern Europe, Africa, and South-East Asia you will probably receive a quality product starting from $41-$50/hour. And only in Continental Asia and post-Soviet countries the price of $31-$40 per hour generally means a good quality product. As you can see, the notion of cheap, cost-effective, and expensive, varies across different regions. For instance, if you find a website development agency in Mexico or Turkey that charges $45 per hour, you will most likely deal with a cost-effective service. While in the USA and Israel this cost is cheap, which means a deliverable might not satisfy your high-quality expectations. In Indonesia, in contrast, web development for $45/hour is an overpriced service. If mobile app developers in Ukraine charge $35 per hour, they should provide a high-quality service, but the same price can be quite risky in the majority of other countries of the world provided you need an outstanding app. In other words, in post-Soviet countries and Continental Asia you will likely receive a high-quality product for a price lower than in any other region. Provided you do not need a full contract pricing information, the IT support cost will be the same as the software rates we analysed in this research, since developers normally change per hour of these service. Price is not the only criteria that should define your choice of an IT service provider. You need to consider a great number of other things before choosing a developer. 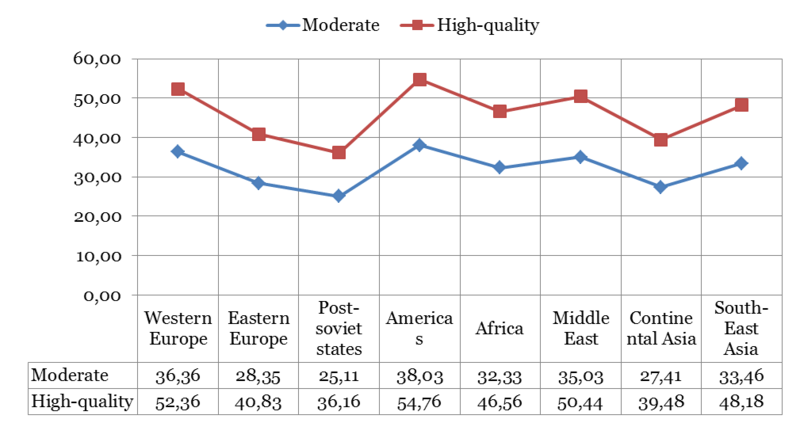 We hope this study casts some light on the correlation between price and quality across the world.